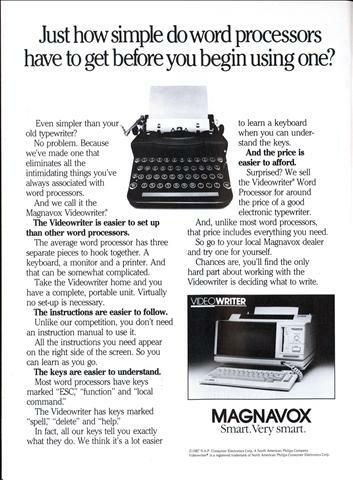 Just how simple do word processors have to get before you begin using one? Even simpler than your old typewriter? No problem. Because we’ve made one that eliminates all the intimidating things you’ve always associated with word processors. What matters bad weather when Radio entertains. RADIO’S “every-hour-every-where” broadcast schedule is the most stupendous organization of the means of entertainment the world has ever witnessed. 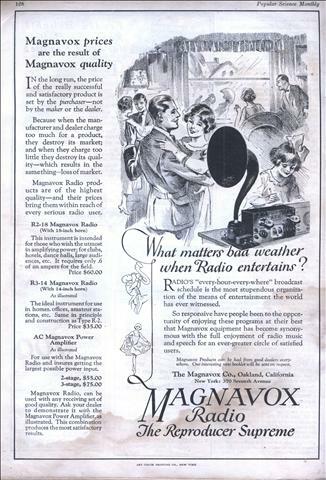 So responsive have people been to the opportunity of enjoying these programs at their best that Magnavox equipment has become synonymous with the full enjoyment of radio music and speech for an ever-greater circle of satisfied users. 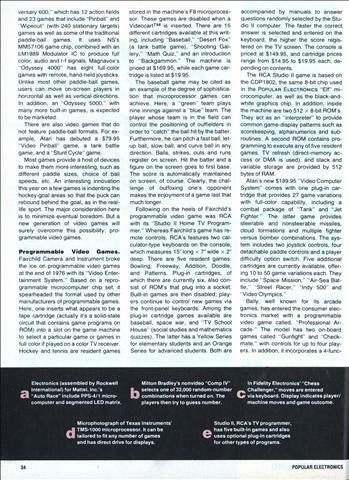 A host of video and nonvideo electronic games, many using microprocessors, promises the public more stimulating fun for leisure time. 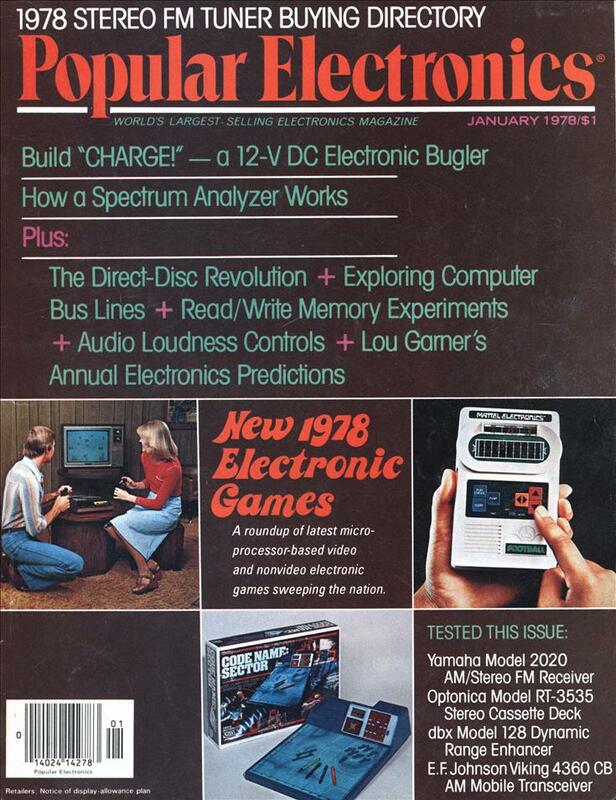 A COUPLE of years ago, an electronic video game consisted of a simple “black box” that, when connected to a TV receiver, produced little more than some version of video table tennis. 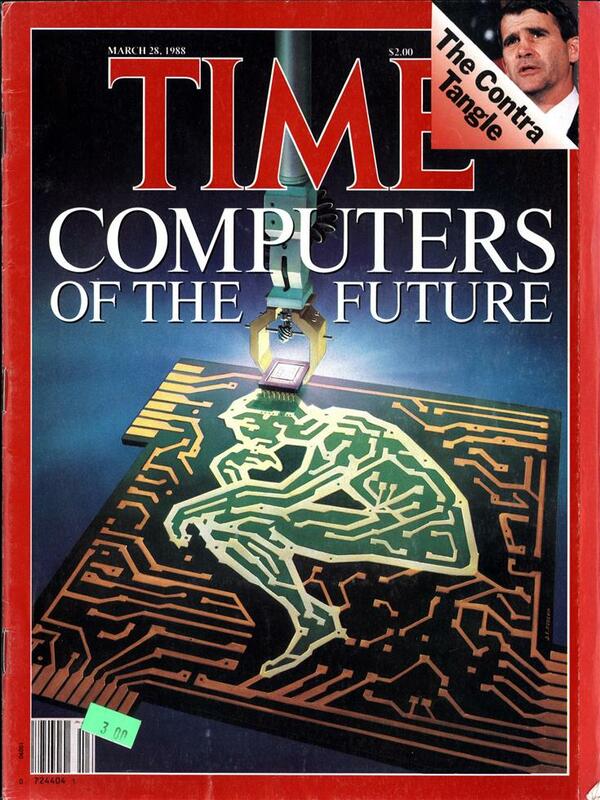 In some cases today, that black box is virtually a personal computer. Now there are games whose color images try your gambling instincts at blackjack, your “destroy” capability against an enemy tank, your patience and fortitude through a maze while a “cat” attempts to devour you, your artistic talent with computer-drawn pictures, or your knowledge of math and history. 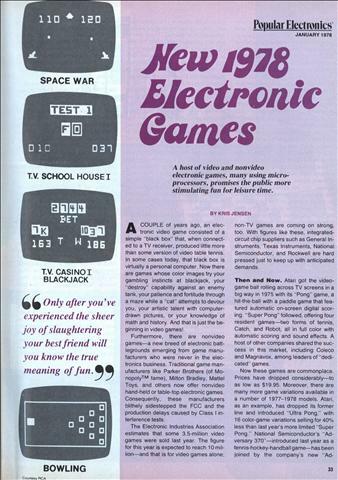 And that is just the beginning in video games! 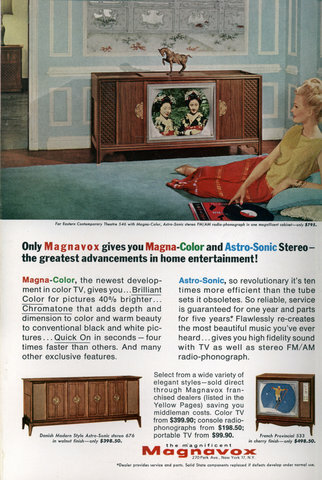 Only Magnavox gives you Magna-Color and Astro-Sonic Stereo -the greatest advancements in home entertainment! Magna-Color, the newest development in color TV, gives you…Brilliant Color for pictures 40% brighter… Chromatone that adds depth and dimension to color and warm beauty to conventional black and white pictures… Quick On in seconds â€”four times faster than others. And many other exclusive features. 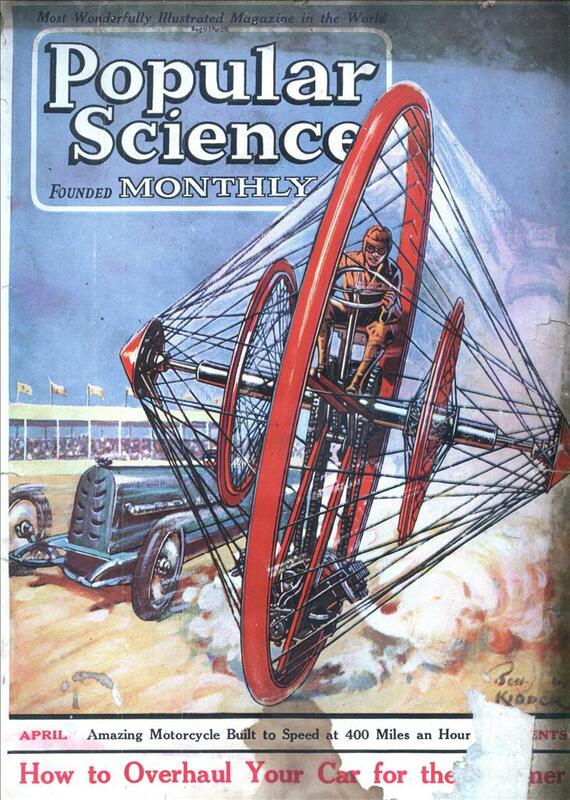 Astro-Sonic, so revolutionary it’s ten times more efficient than the tube sets it obsoletes. So reliable, service is guaranteed for one year and parts for five years? Flawlessly re-creates the most beautiful music you’ve ever heard… gives you high fidelity sound with TV as well as stereo FM/AM radio-phonograph. 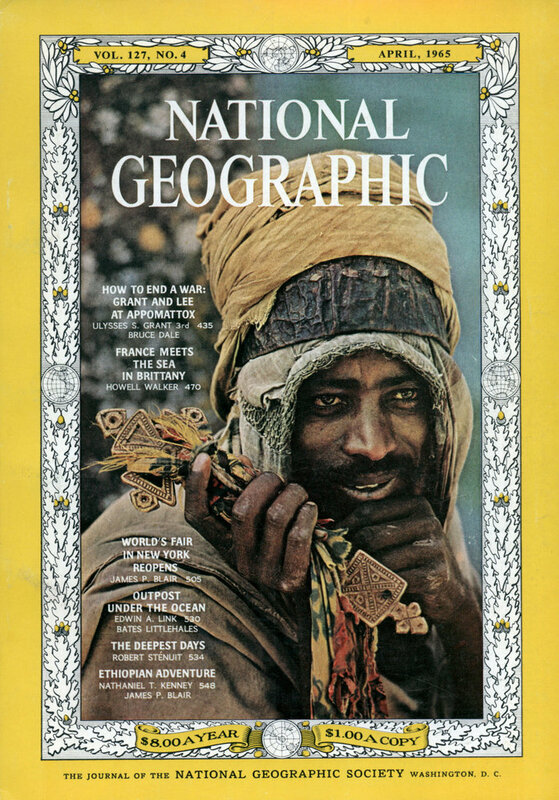 Select from a wide variety of elegant styles â€”sold direct through Magnavox fran-chised dealers (listed in the Yellow Pages) saving you middleman costs. Color TV from $399.90; console radio-phonographs from $198.50; portable TV from $99.90.